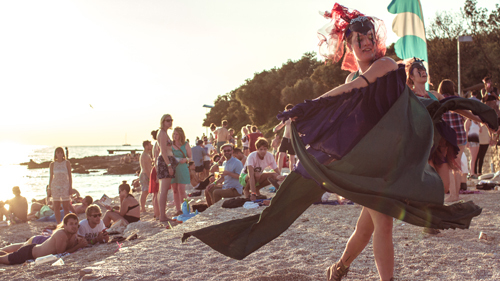 Within a few years, there will be a festival on the Croatian coast every single week. Come 2016, you’ll doubtless be able to celebrate Christmas on a Hessle Audio boat party, or see in the New Year at Punta Christo castle with Moodymann and Theo Parrish. Even in 2013, the calendar’s starting to get clogged, and the latest addition to Croatia’s bulging festival line-up extends the season through to mid-September. Unknown is a collaboration between three of the UK festival game’s biggest independent names — Hideout, Field Day, and the Warehouse Project — and unsurprisingly, attracts an almost exclusively British crowd. Where its seemingly infinite competitors sprawl across weekends, Unknown’s organisers opt to run Tuesday through Saturday, so punters can use the weekends for travel. It’s a smart move — no one relishes rolling back from a festival and straight into work — and it plays into one of Unknown’s biggest strengths; its location. At Croatian festivals you expect beaches (even if they are pebbled) but because Unknown’s hosted in a snazzy tourist resort, sunlight hours are based around twin infinity pools. Here, UK promoters like Mono_Cult and Butter Side Up knock out lazy house, disco and hip-hop, while the scantily clad pickle themselves on garish cocktails. It gives the daytime a nice focus, although at sundown the stages proper suffer from a transitional period between day and night. On the Forest Stage, the festival’s second biggest arena and DJ Mag’s home for most of the week, the likes of Richy Ahmed and Subb-an end up playing twilight sets to sparse crowds, even as the pool retains its buzz. You can't blame people for needing time to realign, though. The festival theoretically shuts at six, but whether it's Scuba negotiating to keep the stage open for another 90 minutes of garage and piano house, or Jackmaster powering through until almost noon on the final day, the sun rises every morning on very few sleeping bodies. As you’d expect from brands with this promoting pedigree, Unknown’s production is flawless. There’s normally a danger with debut festivals that soundsystems won’t be up to scratch, or that there’ll be a dearth of toilets or bars or food. And while the audio doesn’t quite match up to somewhere like Dimensions, where the engineers are billed almost alongside the artists, each stage rings out loud and clear. As for booze, everything’s bought via handy swipecards. While this does help reduce queues, it also means we quickly lose track of just how much we’ve spent; the credit card bill that dropped through DJ Mag’s door when we got home left a dent in the floorboards. Across its six stages and numerous boat parties, Unknown focuses firmly on the more accessible end of house/techno. Whether it’s Erol Alkan dropping 'Blue Monday' and Fred Falke between rippling electro, Kerri Chandler sending the crowd by the pool into raptures as the strains of Green Velvet’s 'Bigger Than Prince' creep through those trademark hi-hats, or Todd Terje’s piano-centric disco, pumping across a dancefloor as busy with trees as it is bodies, it’s festival favourites all the way. For the noticeably youthful crowd, though, this is exactly what they’re after. The most manic crowds all week are pulled in by the most chart-friendly acts — as we walk through the forest just before Disclosure’s set on the other side of the site, we’re forced to fight our way through a river of glitter-clad teens heading their way. But there are some surprises. Our day of utter Innervisions immersion, where a Dixon and Âme boat party is followed first by Henrik Schwarz’s explosive live show, then a further five back-to-back hours from the duo, veers at times into pupil-dilating trance techno. Equally, in the early mornings as the sun rises, we find ourselves drawn again and again to the Moroccan Medina stage, where the worse-for-wear dance to TLC and the Human League, and we find ourselves in a lunging competition with a number of lipstick-clad gents. We can’t remember if we won, but it seems unlikely. Croatia isn’t crying out for more festivals, and none of the acts on Unknown’s line-up are strangers to the Adriatic coast. But its organisers have managed to build a party with a distinct personality, and more than anything else that’s what festivals need to stand out. As Unknown settles into its site, it could well prove to be one of Croatia’s best.